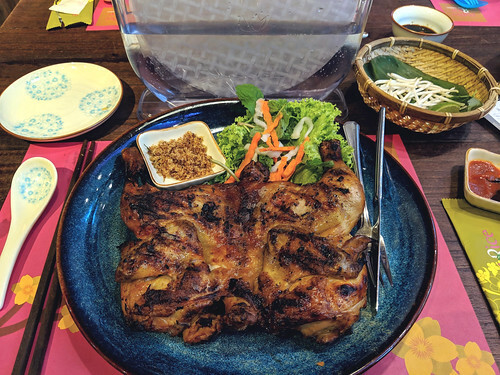 That butterflied chicken might look a bit odd, but it was the signature item at this place (5 Changi Business Park Central 1 #B1-26, 6443-1261), and it was much better than I thought it would be. It had a nice char-grilled aroma and skin that went nicely with a dip in that brown herbal salt mixture, making for a decent deal at only S$18.80 (US$13.90). Granted, the breast meat was a bit dry, and they should use a smaller-sized rice paper. But that clear plastic water/paper contraption was certainly more elegant than the spray bottle that Wrap & Roll would provide.